Did IEX lie about using the SIPs? 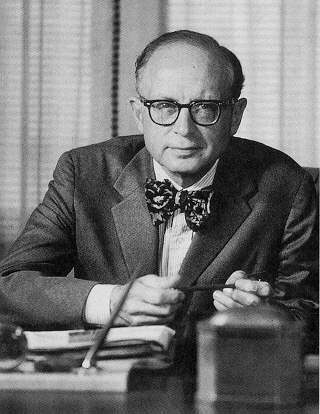 it is the illusion of knowledge.” - Daniel J. Boorstin. What serves no useful client purpose, looks like a conflict, smells like conflict, and is a conflict? The Data Core platform is an encrypted cloud environment that is used to collect, normalize, store and analyze trading data for institutional investors. No technical work is required for investors to join and participate in the Data Core community. I can smell the toxic spin that is this vertically integrated vortex of conflict from here. Can you? Let’s meander around this steaming pile before someone wraps it, sets in on fire, and rings your doorbell. IEX’s business development proceeds immaturely without a clear sense of purpose. It’s scrambling. IEX may need a grown up to be in charge one day. it’s now starting up a conflicted low-profit business to try and dupe investors into routing to their exchange or into dumping their broker. What does that footnote on “Neutral analysis” intimate in the above graphic? Third Party analysis will come in the second phase of Data CORE deployment. Aggregated peer data will not be available to third parties. That footnote means there can be no neutral analysis in the initial phases of the roll-out as aggregated peer data will not be available to third parties. At least your security won’t be compromised until then? Will IEX keep all of Data Cores development in-house and secure? It can’t win either way as it will be a security risk or a prejudice and conflict risk one way or the other. Anonymised GPS tracking data can be used to track people, know where they live, understand their activities, and estimate their whereabouts. Just as authors leave indelible fingerprints in their work, it may be hard to dissociate Data Core data from the identifies of the clients and traders involved. Can you trust IEX? I argue IEX have misled clients and leaked their data, and continue to do so, every day. You should not trust them. Why is IEX trying to fool the financial field into paying for this conflicted contrivance? Notably, IEX plans not to charge too much at all for this product. Data Core, as now parametrised, is not a great business, revenue or profit-wise, to even start. Giving away a service? That sounds like a rebate. Your alarm bells should immediately start ringing. At an estimate of $500 per month per client, it will be hard for IEX to pay the Data Core employees’ payroll. What is the true purpose of this new business? To prop up a failing business plan, perhaps? OK, OK, get to the point, should IEX be an exchange? Yes, I think IEX should be allowed to be an exchange based on my principle that it offers a bit of innovation with the last-look DPEG, it is acting honourably, and it is no worse than other platforms. IEX’s “look at our pretty colour” marketing does not appeal to my inner engineer that wishes for a proper purpose. However, just because the IEX business model is a bit daft and its presence is suggestive of petty pretty pointlessness doesn’t mean it shouldn’t be allowed to be an exchange. IEX should be allowed to be stupid and fail. Stupidity is not a crime. After all, it is wrong to deny people the good grace of capitalistic failure. History shows I was both a bit wrong and a bit right. The wrong bit was that I don’t think anyone, including me, appreciated how dark IEX would be. It is 75 to 85 per cent dark. Ace of spades dark. That is terrible public policy. Its Dark Fader nature undermines the utility of transparency and price discovery we expect a public utility’s license to serve. Many exchanges are a bit dark thanks to pegs, hiddens, and icebergs. 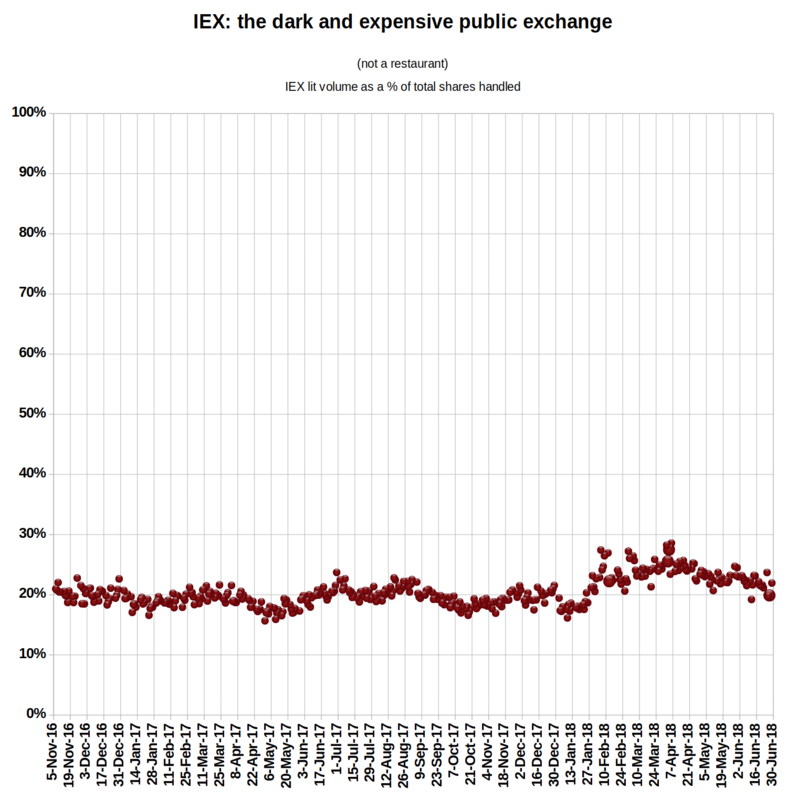 IEX takes the darkness to a deeper shade of black. The market perversion that IEX has become suggests the SEC got it wrong. It should not have approved IEX to be a public exchange. The SEC certainly needs to consider how it may improve the National Market System (NMS) by sending IEX back to the ATS fold where it belongs. Also, I was a bit right when I said, “it is wrong to deny people the good grace of capitalistic failure.” IEX hasn’t been the success the IEX business plan forecast. The more sophisticated investor has understood the poor value and dangerously unsafe trading conditions on offer. These potential clients have wisely ignored or restricted their interactions as appropriate. I’ll opine a little later on those dangerous conditions to highlight some aspects of marketplace design IEX has wrong. The gap between what the original business plan over-promised and what IEX is under-delivering is growing. Each of those three boast nearly 20% of daily exchange volume, compared with about 2.22% for IEX. “We don’t focus a lot on market share,” Katsuyama said. Music to a venture capitalists ears? When IEX raised funds about two years ago, it told its backers that it planned to reach more than 8% market share by 2017. That estimate was based on winning approval as an exchange in 2015, a spokesman said. 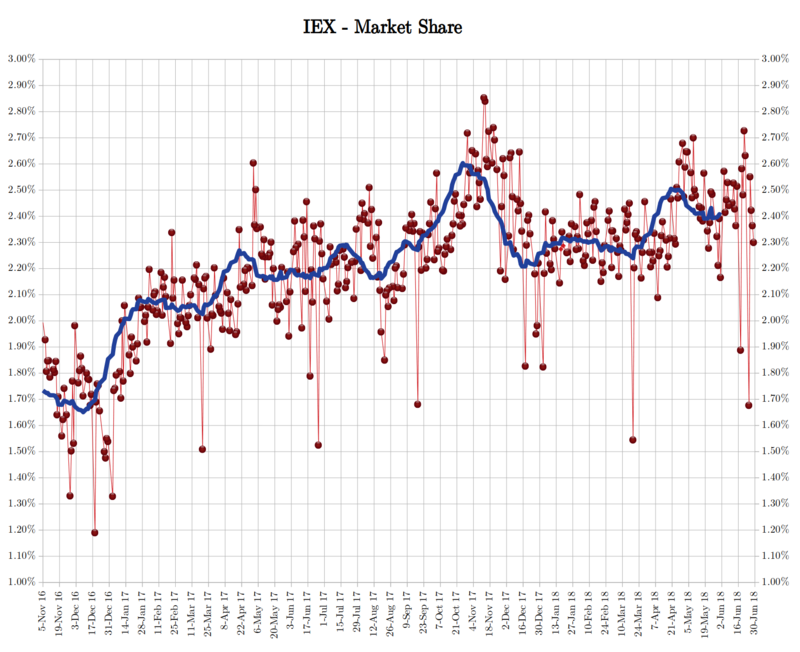 IEX declined to reveal updated market-share goals. To me the surprise is not why IEX lit activity is below twenty-five per cent, it is why investor naivety is such that IEX trades at all. As an exchange, IEX also can compete to list the shares of new public companies, which is a significant source of revenue for exchanges. Nasdaq generated $274 million in fees from new listings in 2015, according to its most recent annual report. IEX’s listing business has zero takers. I’m not sure I would want to be associated with an exchange that misleads investors. What would that say about your company? The Wynn attempt does not encourage either. Who wants to be the next Wynn? #MeToo? The company, which had said it would have its listings business up and running in early 2018, has not been able to attract a company to list. That’s despite the firm giving firms big incentives to list shares on the venue. IEX was willing to cover the listings cost of companies that announce their intent to switch over to their exchange within 120 days of the first IEX listing, according to a filing with the Securities and Exchange Commission. Such firms will get at least $US250,000 in fee credits. Market rumours suggest IEX has been looking to raise $100M in new funds from investors. The rumours I hear down here in Huonville Tasmania suggest IEX is getting pushback on this raise. Take that with a grain of salt as I suspect the well-travelled rumours I hear are not only old but maybe slightly prejudiced. You can probably imagine why. IEX’s failure in market share and failure in listings may not be encouraging new shareholders to jump at such an “interesting” opportunity. there is a growing realisation the exchange’s technical architecture delivers poor outcomes for asset managers when compared to the existing exchanges. One of the problems with the current NMS set-up is measuring your trade outcomes. Telling the wheat from the chaff, in terms of execution quality, routing, and broker performance is difficult. The mandated SEC reporting is helpful but woefully insufficient. Dependent and independent parties fill this void with a myriad of products to help investors navigate the NMS landscape. Independent parties are often preferred as you’d like an independent opinion to help. It is unlikely a dependent party is going to tell you to route less business to themselves. Will IEX do this? I think you and I may be on the same page in this respect. It is hard to tell how dishonest IEX is. They are certainly deluded. That is without question. Are they dishonest? I used to think not but I changed my mind a while ago. When the facts change it is good to re-evaluate. Since these stats are publicly available, IEX management had to be aware of the fact that investors would lose money by directing market orders to IEX. The FDA was created, in part, to prosecute snake oil salesman and stop their fraudulent marketing practices. The SEC was created to protect investors from fraudulent claims. Why have they not brought an action against IEX for their direct marketing to retail when management knew that such orders would receive inferior execution quality? Verbally threaten. Accuse defamation. Demand retraction. Misdirect retail investors to worse outcomes. Delusional is a bit soft. Dishonest seems more appropriate to me. You should at least try to parse carefully such words in the acrimonious IEX debate and make up your own calibrated opinion. Perhaps you should change your mind as I did? In ‘Flash Boys,’ Lewis describes Brad Katsuyama as a broker that developed a new insight into the market that led to the tool Thor at RBC. Thor could hit every bid or offer in the market by timing the order releases so the child orders would hit every exchange concurrently. 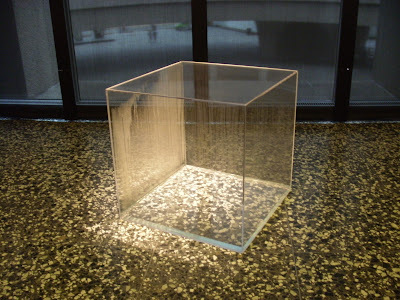 So much for phantom liquidity. Turns out it was real. Basically, Brad was being paid $2 million a year to execute badly for his clients as many others in the market already knew this somewhat obvious fact. Brad mistakenly thought he was on to something. He decided if he could slow down every order at a new exchange then he could prevent his customers being picked off. Off he charged and created IEX on this dumb premise. It was dumb premise as slowing down the orders just makes you an inefficient and slow exchange with greater risks for investors. You’re still susceptible to faster traders picking off orders. It remains a race to the order queues. Nanoseconds still matter at IEX. Mr Lewis writes of Mr Katsuyama posing this problem of disappearing quotes that Thor managed to hit to the SEC. The SEC correctly and wisely pointed out that the liquidity was real. Perhaps the nature of market fragmentation led to over-provisioning. In that context it Thor may be harmful and result in fewer prices being posted passively. The SEC was right and IEX is wrong. Market makers do need to over-provision in such a competitive fragmented market. They will naturally withdraw orders due to their inventory model as they get hit. If there is a greater risk of being simultaneously being hit you will not post so much. The market naturally gets thinner. It shows how limited IEX’s understanding of the market is. Do you think Data Core will be smarter and not also misunderstand the market in their analysis? The slowness of IEX, due to its speed-bump and lame technology platform, adds risk for all traders. Not knowing is a risk. At a faster market, you can control your risks better. There is more opportunity to hedge, arb, and to re-provision at a faster exchange. IEX is not that exchange. IEX’s slowness is a problem for your trading. If you only occasionally trade you may not care, but you should. It affects not just you, but also your counterparties. Your ability to get a fair and efficient price is hampered by the greater risk a slow exchange exposes you and your counterparties to. It is not all about you, even when it is all about you. Are you going to trust Data Core if they tell you a faster exchange is not better for your risk management? A slow exchange is a bad exchange. IEX is a slow exchange. Will Data Core tell you IEX is a bad exchange? There is nothing ostensibly wrong with darkness. Index funds give you passivity which can be healthy. Too much darkness or passivity perverts transparency and efficiency. At the extreme, the market gets weird where prices are devoid of proper influence and thus may not reflect fair valuations efficiently. Price discovery is harmed. Mr Jack Bogle, an indexing elder statesman, suggested there is some upper limit to such interference. IEX is doing what it can to interfere with the orderly operation of US equity markets. IEX has touted the seemingly good results of effective spreads in the CBOE (nee BATS) data statistics published on CBOE’s webby tubes. Those statistics mislead investors as it mixes dark and lit transactions. Such a mix confounds benchmarking around the mid-point where that may be an inappropriate measure for such trades. Think about IEX’s mid-point obsession. Such a thought is a bad outcome for those institutional investors prepared to sit passively in the market and earn some spread. Yet those funds getting this positive outcome will be marked poorly in both Dr Hu’s SEC report and in the CBOE statistics. Try telling that to the asset manager with the extra coin in their pocket. Another way IEX statistics mislead investors is due to their fake crumbling quote indicator preventing a trade occurring when prices change. Such a non-trading, risk creating exchange, distorts execution statistics. As a fine purveyor of risk, trader or investor, you quite often really want to trade when things are happening. You know, when the price is moving. It’s part of the utility of the whole marketplace thing. It is disturbingly weird that the speed-bump enabled dark fading order types prevent you from trading at those times. They fade rather than trade. This will also make some of the trade stats look artificially too good on IEX as trades don’t happen at times of risk. That is really quite strange for a public risk-based utility. More alternative facts running around as statistics is all we need. Also, as IEX’s slightly dumb dark fader algo generates lots of false positives, you’ll often lose priority to other dark non-fading pegs. Well managed mid-point pegs may dominate dark-fading pegs. The whole IEX pile of franked up dark matter is a bit messy. IEX is misleading investors with third party statistics. Do you think if it has the opportunity to tell you the truth with Data Core, IEX will suddenly decide to stop misleading its clients? I may agree with your opinion on that. 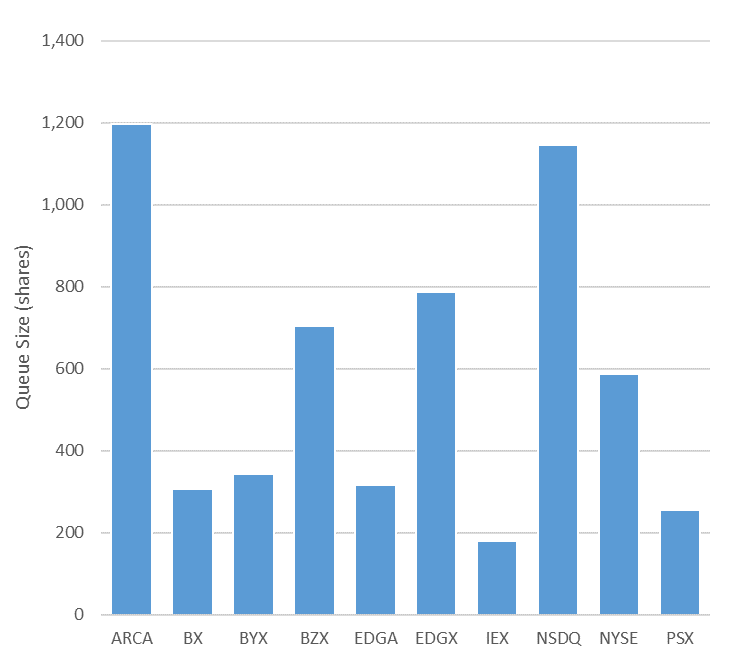 This data, provided by BestXStats, is based on all marketable orders in NYSE listed stocks sent to the exchanges and reported pursuant to Rule 605 in July. It only includes orders without trading restrictions that are from 100 to 9,999 shares. This is the most relevant metric for determining execution quality, as it is the only “apples to apples” comparison between the exchanges. IEX is the expensive inferior exchange. Don’t believe the hype. They are the public’s enemy and not your friend. “I see through the lies of the Jedi. I do not fear the dark side as you do. Readers may be familiar with the idea that I sometimes refer to IEX as the Dark Fader. This is particularly due to a particular spin IEX continues to try to sucker its investors with. In its rules, it refers to lifting the price towards best in periods of stability. Come in spinner. The market is stable most of the time. What is really happening is that IEX fades the quote in such periods. It is the Dark Fader. IEX gives dark a bad name. I’m not a big fan of Nasdaq’s mid-point extended life order (M-ELO) due to the gaming, albeit pretty minor, it allows. I do think M-ELO is a better solution than what IEX provides. Many an ATS also provide a better solution for dark orders than the IEX solution for particular circumstances. Dark should have no place in public markets but there is utility there. Just as we should worry about IEX’s darkness, we should also be worried about the growing use of Nasdaq’s M-ELO. M-ELO traded 34,159,011 tier one shares the week of June 11, 2018. That is enough volume to stand alone as an ATS in its own right instead of being an embedded ATS in a public marketplace. M-ELO would rank as 20th out of an expanded 34 if it was considered an ATS. The rebates and fees associated with M-ELO certainly offer food for thought when considering the PFOF competition. IEX should be worried. M-ELO offers significant benefits and some risks, but we have to consider if this is the direction we want public markets to head in. Where should we partition the dark versus lit as a matter of public policy? 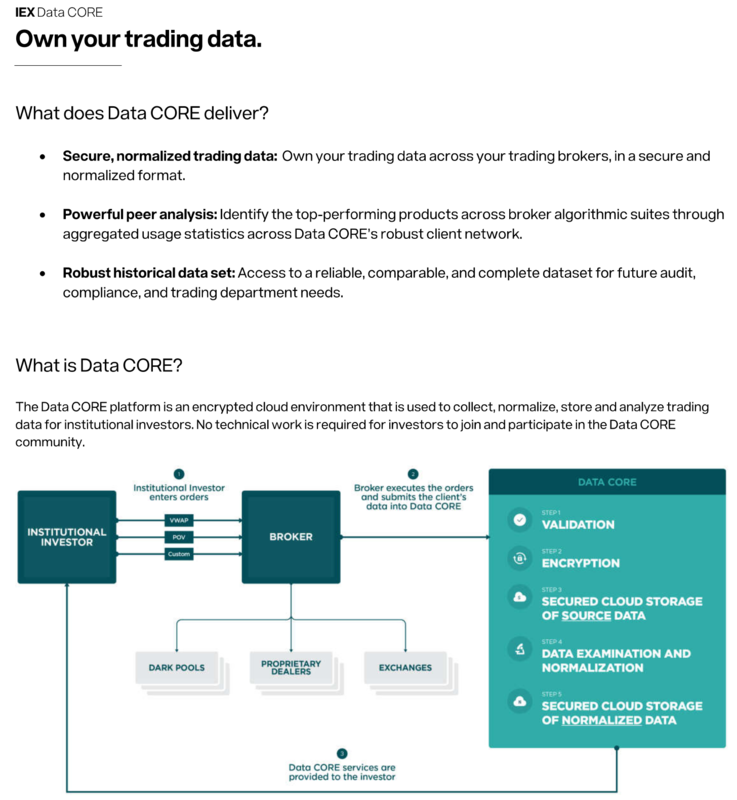 Do you think Data Core will recommend M-ELO, other alternative pegs, or an ATS to you over IEX? includes quotations from not all of the exchanges, just these ones: XNYS, ARCX, XNGS, XBOS, BATS, BATY, EDGX, EDGA. IEX claims it is, “Fighting Math with Math” which is a little embarrassing considering how bad their math is. You should find it easy to understand that these formulae treat all stocks the same. This cannot possibly be equally valid for all stocks. One size does not fit all. 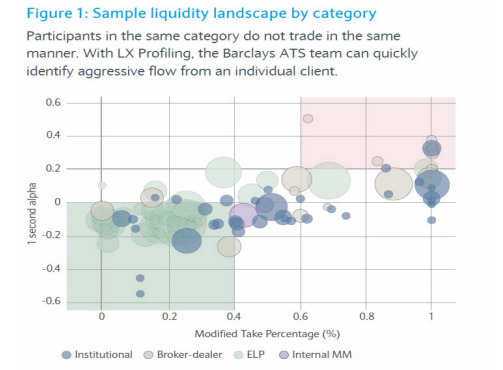 Liquid stocks and illiquid stocks trade differently. IEX math is bad math. The important point here is that IEX has misled you by calling this a Quote Instability indicator. It has been so poorly put together that for some stocks it is more likely to indicate a stable quote. Also, it was not unlikely to indicate the wrong side as unstable due to its timing limitations which have improved, but not been eliminated, in the latest change to the specification. That was previous to the current tweak. How bad is the new one? It is hard to say. We don’t have access to the same chaotic data from all exchanges used internally by IEX. This makes the high fees for this trade not only unknowable a priori, but they are also impossible to audit ex-ante when they show up on your invoice. Just because you subvert the meaning of common English words and capitalise them into a proper noun doesn’t make the term a reasonable representation. Quote Stability is IEX’s version of fake news. When Data Core tells you about trading at unstable times, will you pause? You’d think price discovery would be considered a fairly fundamental feature for an NMS exchange. IEX’s fake Quote Stability is aimed at penalising you if you dare trade when the price changes. Price discovery be damned. For example, as mentioned, IEX has some cunning misdirection in their application for their Primary Peg order type. It talks about reaching up to the BBO when the market is stable rather than thinking of it as a non-displayed quote fade. Schmarketing. Fading is fading. Go on. Admit it. The market structure micro-option you provide for providing a passive price at an exchange is often paid for by the exchange with a rebate. It is not an unreasonable solution8. In the IEX case, when the price changes the aggressor pays a heavy price in an unauditable fee thanks to the fake Quote Instability voodoo. That fee goes to the exchange, not the price provider. IEX is getting rich off the back of hard working asset managers who try to improve their clients’ funds’ returns with passive prices at best. Is IEX considering the welfare of their clients or the welfare of their own pockets? Will Data Core be just a sympathetic to helping its clients or will Data Core also be motivated by helping itself to your pocketbook, however indirectly? “At the end of the day, this conflict between brokers getting paid a rebate by the exchange or getting the higher quality execution for their client — that conflict is going to come to a head and we’ll be the beneficiary of that,” says Mr Katsuyama, who insists that IEX gets better executions for clients. This offensive term implies criminal behaviour. It is perfectly reasonable to pay for what I refer to as a market structure micro-option10. Passive prices can be hard to attract. It is not unreasonable to reward such extra risk with improved or negative fees. 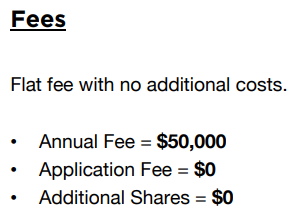 IEX does not refer to the zero fees that are sometimes available on its exchange as kickbacks. Nor does it refer to discounts it may grant as rebates. What would you call receiving a service for free? The hypocrisy from the IEX hype machine is hard to countenance. Large rebates are also helpful in competing with Payment For Order Flow (PFOF). NMS exchanges can’t quote prices at less than a cent. They are restricted in competitive response to direct sub-penny pricing that may be available through PFOF. I’m not a fan of PFOF as it seems an abrogation of best execution by using a third party to provide a better execution for a fee. It’s a little oxymoronic. PFOF often provides many customers, especially retail, with much better execution outcomes thanks to this sub-penny pricing advantage. While I’d like to see it eliminated, customers would be worse off. We have to be careful about considering its elimination. Rebates provide one way an exchange may compete against the sub-penny pricing available to PFOF and ATS executions. IEX’s rabid and offensive offensive against rebates brings into question their ability to tell their customers the truth. Such a clear misdemeanour should make you question their ability to reason truthfully about your execution profile from their Data Core platform. IEX simply can’t be trusted. IEX ran a bunch of pieces and media promoting that it had the shortest queues and thus it was the best exchange to trade at. Their marketing was a carefully designed deception. IEX argue that shorter queues are better. They don’t talk about the higher risks associated with shorter queues. That would be inconvenient. Shorter queues are always a worry for a market maker as it means you’re more likely to be traded through. Shorter queues are a market risk to worry about. IEX gloss over this simple reality. They promote the idea that it is easy to get filled as you’re more likely to be top of the book, which is true if you can stand the heat that comes with that risky queue. Also, do you notice something strange about that chart? Where is the Chicago Stock Exchange (CHX)? The inconvenient truth was that CHX has shorter queues, so IEX left them off the chart. The inconvenient truth is that shorter queues offer a trade-off of better priority, if anyone turns up, against more risk of being traded through. Why did IEX mislead its customers by leaving CHX off their chart? Barclays will pay $70m, the largest ever fine for operating a dark pool, and has admitted that it misled investors and violated securities laws and has agreed that it will install an independent monitor to oversee its “Barclays LX”. If you ask, I suspect IEX will tell you it thinks its dark pool is fine. In particular, it omitted the bubble for Tradebot, a high-frequency trading firm that traded on the LX dark pool and would have earned itself a big bubble. Perhaps a fine will make IEX no longer feel fine? Can you trust Data Core to advise you correctly about shorter queues and your prospects at various venues? Co-location is one great fair-play feature of modern markets. Co-location is referred to by IEX as an evil and one of three major compromises it will not introduce to its marketplace. HFT’s like a lack of colo as it gives them the opportunity to jockey for better access and defeat other traders in priority. IEX respects time priority. If you’re a nanosecond faster to the POP at IEX you’ll still beat the other nanosecond slower trader. Sure you go through a 350-microsecond delay but that is irrelevant to the race to priority, it just adds risk to executions. A lack of colo provides the HFT with the potential for an edge. At IEX you have to be careful about the co-lo and get a close position and try to game your cable length to shave some nanoseconds off your trade to tick times. CBOE/BATS, Nasdaq, and ICE/NYSE go to great lengths to provide fair co-location facilities to ensure a level playing field for all. Amongst NMS exchanges, only IEX allows an uneven playing field which may be tilted in the favour of the better endowed. It is noteworthy that despite the advantage of gaming a no-colo environment, many HFTs prefer colos as it means you can’t be ambushed by someone with better access. The expense of gaming a lack of colo can be frustrating. Asset managers and brokers should question IEX’s improper stance on co-location. IEX is very wrong on co-location. If your friendly Data Core representative spins out the company line and warns you about the dangers of co-location what will you believe? As I pointed out in the recent update, IEX aggressively denounced other platforms for pricing off of the SIP. Do you remember the classic Lewis, Katsuyama, O’Brien CNBC debate where Mr Katsuyama accused BATS Mr William O’Brien of pricing off the SIP and disadvantaging his customers? Mr O’Brien denied it as it slipped his mind in the heat of the moment the acquired Direct Edge did that. O’Brien was no longer at BATS four months later. Despite Mr Katsuyama’s continued misrepresentations, he remains employed. IEX now uses the SIP to contribute to its pricing, as per this filing, SR-IEX-2018-10. Proposed rule change to amend rule 11.410(a) to update the market data source that the Exchange will use to determine the Top of Book quotation for NYSE National in anticipation of its planned re-launch. … the Exchange proposes to amend and update the table specifying the primary and secondary sources for NYSE National (“XCIS”) in anticipation of the planned re-launch of XCIS on May 21, 2018.9 As proposed, the Exchange will use securities information processor (“SIP”) data, i.e., CQS SIP data for securities reported under the Consolidated Quotation Services and Consolidated Tape Association plans and UTDF SIP data for securities reported under the Nasdaq Unlisted Trading Privileges national market system plan, to determine XCIS Top of Book quotes. No secondary source is proposed to be specified as SIP data will be used exclusively. Perhaps it’s not that important. In the context of Mr Katsuyama’s misdemeanours, perhaps it is. IEX certainly sends mixed messages. What will you think when Data Core suggests pricing from the SIP is important or unimportant? 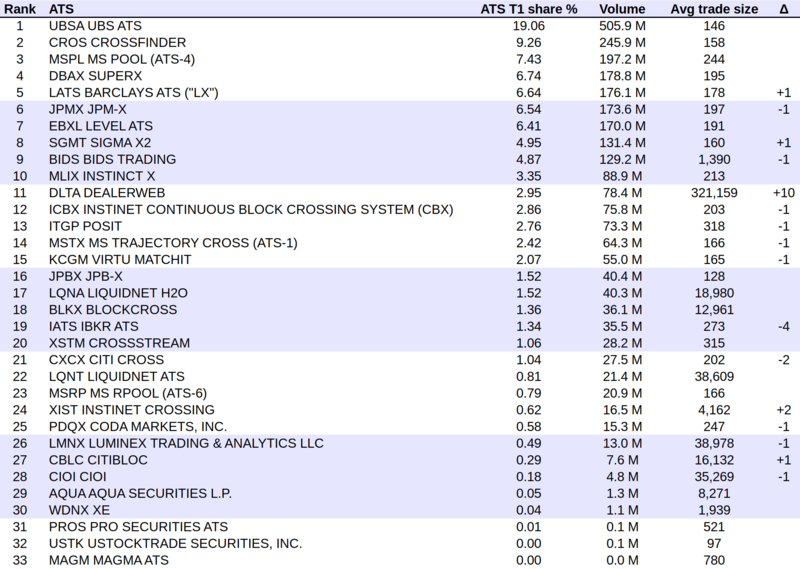 Some supporters of IEX have various large holdings in assorted stocks. When such stocks are traded at IEX this may point to the specific holding that is being acted upon. IEX investors should be more careful. Do you think Data Core would advise Pershing Square not to trade their large holding at IEX? IEX is a slow exchange with a 700-microsecond round-trip bump added to its execution times. IEX reports prices directly to the SIPs. This means that IEX potentially leaks quotes and trades to sophisticated trades with SIP access in advance of letting their own customers know. This makes IEX the most dangerous exchange for latency arbitrage. IEX tells investors its speed-bump makes you safe from the fast HFT traders. This is a lie. IEX is the worst exchange for this thanks to the SIP leakage. To beat some poor sucker dutifully waiting near IEX for their IEX market data, or trade info, you just have to be faster than that 350 microsecond POP delay. You may do that by listening to the SIPs. 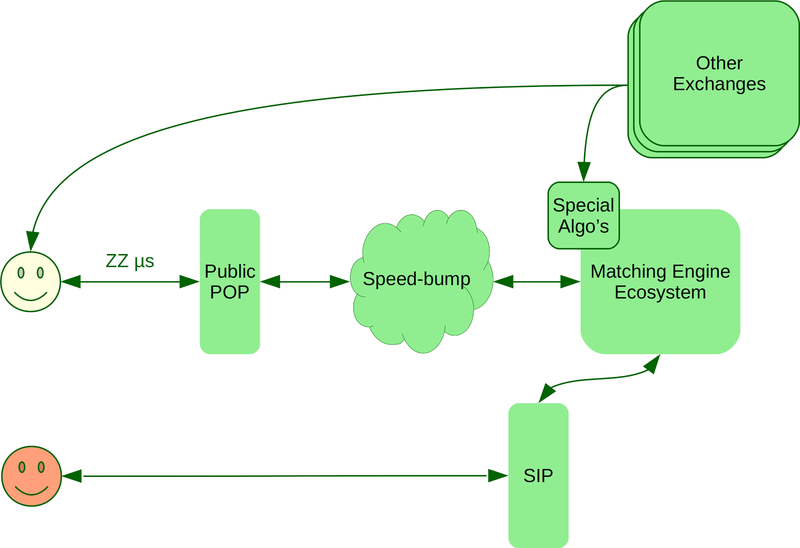 Faster SIPs have improved your chances of gaming that 350 microseconds pop delay, plus possibly the additional 15-20 microsecond engine to pop latency - depending on how the SIP hand-off takes place. It’s not quite the easy, “don’t need no co-lo” experience, is it? 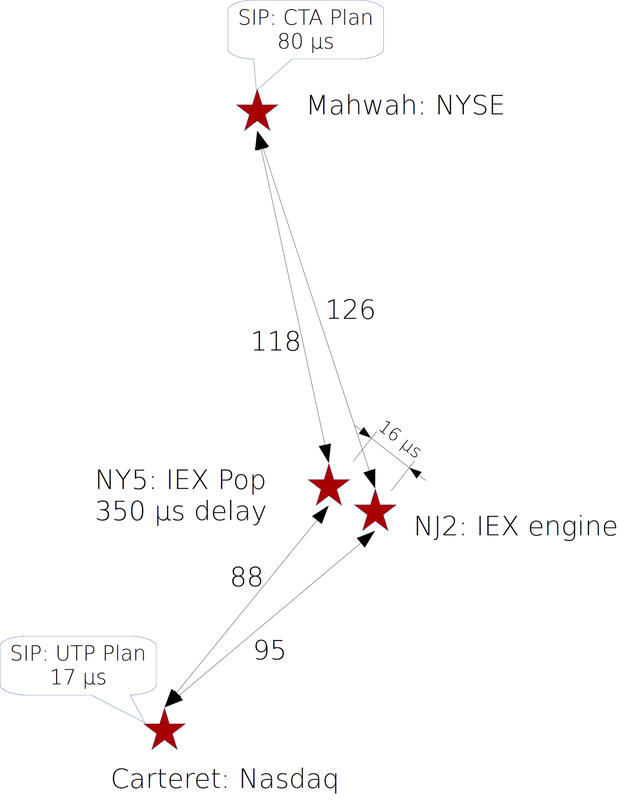 So, if the IEX feeds to the SIPs are reasonable, then traders at Nasdaq & NYSE will have IEX quote and trade data at those locations before IEX customers near IEX. Also, if those customers use their RF links to send the data back to IEX, those traders may still have the data at IEX before the IEX originating customer has their own data. Now you can see why you not only need co-lo at IEX, you need co-lo at Nasdaq & NYSE plus the appropriate RF links to trade optimally at IEX. Ugly. Do you think Data Core will advise customers sensitive to latency arbitrage to not trade at IEX? What we have here is a Frankenstein exchange hybrid that marries a dark pool and regular exchange: a Franken-pool. It’s quite franked up. No one would ever have won SEC approval for a wholly dark pool to become a public exchange and remain dark. A really slow lit exchange is too dumb for words and makes no sense. By marrying the two together, IEX has managed to fool the SEC into approving a dark pool, the Franken-pool, as a public exchange. From a lit perspective, you can ignore the dark part. From the dark pool perspective, the lit part is virtually just one of many external exchanges. The SEC and investors have been hoodwinked. I feel the SEC needs to step back and think more deeply about the privileged role of licensed exchanges in public markets. Not all speed-bumps are the same. Beware of the speed-bump, in particular, the dubious IEX speed-bump. Don’t let IEX or Data Core mislead you. Ask the tough questions. The speed-bump does do something powerful for IEX. The bump helps the Dark Fader replace both brokers’ algorithms and brokers’ custom order types with IEX’s own. A broker cannot compete easily against IEX’s internal DPEG and fake Quote Instability outcome due to the faster market data the internal IEX systems have access to. The 350-microsecond delay means that their algorithms are living in the future. Even when they do they are still lame, but it is a dark advantage even if it is of no consequence, apart from higher fees and risk, to the displayed market. Thus brokers are disadvantaged. Brokers cannot provide their clients with the normal utility and convenience having the brokers’ sophisticated systems and algorithms at their fingertips. As mentioned above, the weak Quote Instability factor is often wrong and yet you can’t compete directly with it to provide your clients with a better service. Fortunately, it is so bad that sometimes you may do better, but it hampers innovation. This is an IEX innovation that kills innovation. It is the kind of innovation the SEC should be trying to prevent rather than support. Do you think Data Core will advise you to use your better algorithm that is unsuitable for IEX and thus avoid IEX? IEX promised simpler order types. Their order types are far from simple. They are not alone there, but it a breaking of a core promise. IEX promised they’d only allow three order types: a market, limit and Mid-point peg. They have not kept that promise. The ‘Flash Boys’ puzzle masters have created many a puzzle for investors wishing to trade at IEX. IEX promised a simpler fee schedule. Again, they are not alone in having a complex schedule. However, IEX does something special here. You can’t even audit or reconcile their fees invoiced due to the chaotic nature of the fake Crumbling Quote fees. This is not the simple one size fits all they promised. IEX promised you won’t need co-lo and they wouldn’t sell to any trader the right to put their computer next to the exchange. Lewis wrote, “Creating fairness was remarkably simple.” The reality is different. IEX has created a complex unfairness. You need to game their pop as best as you can and you need co-lo at Nasdaq and NYSE with Radio Frequency infrastructure to not be disadvantaged with your IEX trading. IEX has made your life worse. IEX promised their speed-bump would protect you from HFT. Their speed-bump adds financial risk to your lit trading. The speed-bump exposes all of your trading to a greater risk of latency arbitrage due to the SIP integration and information leakage. IEX gives you dark and expensive trading that subverts innovation, efficiency, and price discovery. Yet, IEX promises it has improved the market despite its broken promises. Will you trust Data Core’s promises? I’ve heard some murmurings in the market voicing concerns about sharing the trade information Data Core is demanding. I’ve heard the bulge bracket firms are reluctant to provide Data Core with the information they need. Why should they compromise their clients’ information to a business that has demonstrated a remarkable record of deception? Exchanges and other NMS pools are also rightfully not happy. A client suffering under the spell of IEX’s delusions may insist a broker provides the required information. The broker may risk losing that client if they don’t compromise. However, it is not only their clients’ information, it is their own sensitive information they may prefer to keep private, or only share with their client. IEX has already set about dis-intermediating brokers with their dark algorithms, albeit badly. Should a broker help IEX provide competing services, especially when IEX has a record of providing bad services and misleading their clients? What if IEX duplicates a broker’s algorithm? 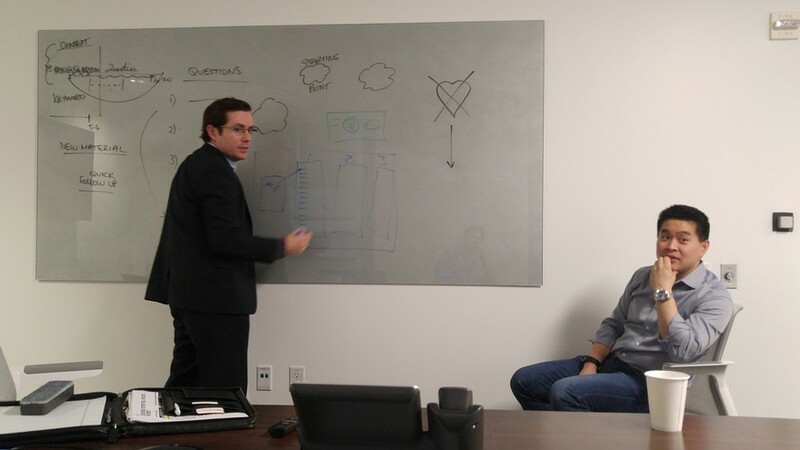 What if IEX patents IP based on what they’ve learned? I don’t think you nor I can imagine competing exchanges or ATSs falling over themselves to help IEX take their market share. Also, data security is an issue, especially as IEX does not have the technical chops to do all the work and have been seeking outside assistance to build and support the disservice. P_EntryTime The time at which the Parent Order was generated by the buy-side client. Ideally, this is a timestamp generated by the buy-side client, but if that is not available, the Parent Order receipt time recorded by the broker will also be accepted. P_AckTime The time at which an acknowledgement was generated by the broker after a Parent Order was received. P_EndTime The time at which the Parent Order entered a terminal state (cancelled or fully executed). P_OrderQuantity The number of shares ordered. P_LimitPrice The limit price placed on the order, if applicable. If the order does not have a limit price, leave the entry blank. BrokerMPID The MPID of the broker Required executing the order. P_NewOrderVsReplace Denote whether an order initiated by the client was new or resulted from a previous order’s amendment. TraderID ID number identifying the trader(s) managing the order. TargetStartTime The time, specified by the client or broker, at which the Parent Order first becomes eligible to trade. TargetEndTime The deadline specified by the client or broker at which the Parent Order becomes ineligible to trade. MinimumPOV Minimum target participation rate of the order, ranging from [0.0000 - 1.0000]. MaximumPOV Numeric Maximum target participation rate of the order, ranging from [0.0000 - 1.0000]. IWouldPrice Price at which the order was willing to execute in full, regardless of other restrictions on the order (i.e. put a floor or ceiling on the stock). IWouldPriceDark Price at which the order was willing to execute in full in the dark. If the order was always willing to trade in full with non-displayed orders, this price can be equal to the limit price. MustComplete TRUE if the Parent Order is expected to fully execute by the end time (or by the end of the day) if it is marketable. And lots more information that you should be a little worried about sharing. Brokers and other market participants should be concerned about such information falling into the hands of a competitor who has proved willing to misdirect, spin, and mislead. IEX’s business is under pressure. Whilst it is likely their exorbitant fees keep them cashflow positive, they are not delivering to their investors as promised. Growth is slow. IEX has over-promised and under-delivered. Not a recipe for investor happiness. IEX are having trouble raising their next $100M. The fees associated with the Data Core business are low enough to invite suspicion of their true motives. They stand in stark contrast to the high execution costs at the exchange. A compromised data analytics business may allow them to further mislead their clients into routing to IEX. Data core personnel may suggest you use their router more and other routers less. The analytics business may also allow them to misappropriate intellectual property embedded in the details in the analysis available to them. After all, IEX started as a kind of misappropriation of the RBC Thor algorithm’s IP as discussed in detail in ‘Flash Boys’. Nasdaq’s ongoing patent lawsuit implies Nasdaq feels IEX does not respect IP. IEX has form. You can’t trust IEX to advise you on your trading. Sure, you may feel you need external help to navigate the NMS landscape IEX has further complicated. It’s bad enough you have to put up with the compromised fanboy noise from the less sophisticated brokers, such as Themis Trading. Imagine drinking directly from the Data Core Kool-Aid trough. Do you think Data Core will be able to tell the difference between good flow and bad flow and how that impacts different brokers? 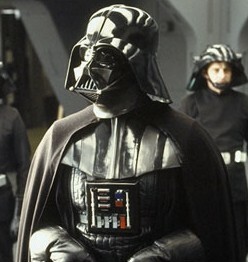 I have no confidence. If Data Core tells you to use a broker that routes more to IEX, can you trust them? Peer analysis is a virtually impossible task without careful active experimentation. You know, the kind of client compromising experiment Brad abused his clients’ funds for at RBC, as ‘Flash Boys’ disclosed. How will the brokers cope with the cost burden Data Core is seeking to place on them? Who pays the piper? You’d hope that IEX would keep the development separate to their exchange business. Are they using the same developers that build the exchange? They seem too small not to make that compromised conflict. Just another conflict? If I was an asset manager who had the misfortune to invest in IEX, I’d want out. Can they get their money out? IEX needs growth to drive valuation to allow trapped shareholders to escape. A seasoned executive would know Data Core is not the right path for IEX. Is it perhaps time for the IEX board to consider a management shake-up? This kind of continuing mess should be testing the board’s patience. If the patience of the board is not being tested, is the board asleep at the wheel? It is virtually impossible to see how IEX may regain confidence from the broader financial markets’ community without letting a little blood. IEX needs to change course. IEX needs to apologise. Be careful out there. IEX has threatened more than one party that I know of first hand. They are not your friend. Data Core is the core data facility you don’t need.